As Bohol hosts the 2nd Philippine Dragon Boat Festival (PDBF) International Club Crew Challenge 2013 in April, tourism stakeholders and local officials here see it as a vehicle for the local tourism industry to grow further. In a recent coordination meeting following the project presentation of the event weeks back, tourism stakeholders, sports enthusiasts as well as local officials agreed the PDBF will be a window of opportunity to showcase the best of Bohol to an international crowd. The event will also further expand the benefits of the competition and boost local tourism. Bohol’s hosting the event would attract a horde of foreign and local tourists, and open countless business opportunities, local organizers said. Aside from these, the PDBF in Bohol could boost the province’s image as a sports destination, giving tourists more reasons to come at the same time bolstering a positive image as a great destination. Bohol Executive Committee Chair Charlie Holganza revealed that part of the activity’s proceeds would go to a corporate social responsibility project in Bohol, especially near the race course. 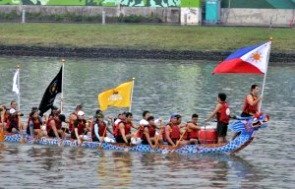 Already recognized in 74 countries, dragonboat rowing has been a sport which Filipinos can excel, PDBF secretary General Pinky Castillo earlier said. Nonette Bolo, chairman of the Bohol Federation of Tour and Travel Operators, who was present during the coordination meeting said her group would come up with packages to make sure the international competitors can get a Bohol teaser in a tour, enough reason for them to go back. Earlier, PDBF presented to Bohol officials the concept of the festival and a timeline which, when followed, would assure the success of the first major dragonboat event in Bohol. Eyed to be held at the shallow strait between mainland Bohol and Dauis in Panglao Island, organizers hope to showcase the area as a historic site of the famed Dapitan Kingdom. Bolo further said that in order to achieve Bohol’s ambitious dream of making the province as the ‘Dragonboat Capital of the Philippines,’ all-out efforts must be done to ensure the PDBF must be a successful one and perhaps plan another dragonboat event. Bohol Governor Edgar Chatto, meanwhile, has seen the immense potential of the event in further pushing local growth and has instructed Provincial Sports Coordinator Joel Molina thru Provincial Administrator Ae Damalerio, to prepare the necessary groundwork. Newly-formed Bohol Paddlers Association and rowing enthusiast Dr. Doyet Dumaluan on the other hand, assured that they would help the organizers, the local government, business, tourism and outdoor sports enthusiasts to ensure that the vision to pin the dragonboat capital to Bohol is achieved. To date, the PDBF has sent instructors to train interested individuals and teams in the art of dragon-boat racing. This is to help train locals who will be joining tune-up competitions in March, before Bohol’s teams could be picked for the international races, Holganza said.